Lists and numbering of Buddhist councils vary between and even within schools. The numbering here is normal in Western writings. According to the scriptures of all Buddhist schools, the first Buddhist Council was held soon after the death of the Buddha, dated by the majority of recent scholars around 400 BCE, under the patronage of king Ajatashatru with the monk Mahakasyapa presiding, at Sattapanni caves Rajgriha (now Rajgir). Its objective was to preserve the Buddha's sayings (suttas) and the monastic discipline or rules (Vinaya). The Suttas were recited by Ananda, and the Vinaya was recited by Upali. According to some sources, the Abhidhamma Pitaka, or its matika, was also included. 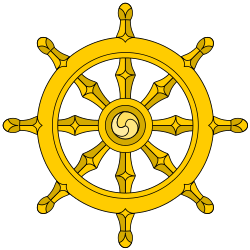 Also the Sangha made the unanimous decision to keep all the rules of the Vinaya, even the lesser and minor rules. The historical records for the so-called "Second Buddhist Council" derive primarily from the canonical Vinayas of various schools. In most cases, these accounts are found at the end of the Skandhaka portion of the Vinaya. While inevitably disagreeing on points of details, they nevertheless agree on roughly the following. About 100 or 110 years after the Buddha's Nirvana, a monk called Yasa, when visiting Vesālī, noticed a number of lax practices among the local monks. A list of "ten points" is given; the most important was that the Vesālī monks, known as Vajjiputtakas, consented to accepting money. Considerable controversy erupted when Yasa refused to follow this practice. He was prosecuted by the Vajjiputtakas, and defended himself by quoting in public a number of canonical passages condemning the use of money by monastics. Wishing to settle the matter, he gathered support from monks of other regions, mainly to the west and south. A group consented to go to Vesāli to settle the matter. After considerable maneuvering, a meeting was held, attended by 700 monks. A council of eight was appointed to consider the matter. This consisted of four locals and four 'westerners'; but some of the locals had already been secretly won over to the westerners' case. Each of the ten points was referred to various canonical precedents. The committee found against the Vajjiputtaka monks. . The canonical accounts end there. Virtually all scholars agree that this second council was a historical event. In striking contrast to the uniform accounts of the Second Council, there are records of several possible "Third Councils". These different versions function to authorize the founding of one particular school or other. According to the Theravāda commentaries and chronicles, the Third Buddhist Council was convened by the Mauryan king Ashoka at Pātaliputra (today's Patna), under the leadership of the monk Moggaliputta Tissa. Its objective was to purify the Buddhist movement, particularly from opportunistic factions which had been attracted by the royal patronage. The king asked the suspect monks what the Buddha taught, and they claimed he taught views such as eternalism, etc., which are condemned in the canonical Brahmajala Sutta. He asked the virtuous monks, and they replied that the Buddha was a "Teacher of Analysis" (Vibhajjavādin), an answer that was confirmed by Moggaliputta Tissa. The Council proceeded to recite the scriptures once more, adding to the canon Moggaliputta Tissa's own book, the Kathavatthu, a discussion of various dissenting Buddhist views now contained in the Theravāda Abhidhamma Pitaka. Also, emissaries were sent to various countries in order to spread Buddhism, as far as the Greek kingdoms in the West (in particular the neighboring Greco-Bactrian Kingdom, and possibly even farther according to the inscriptions left on stone pillars by Ashoka). According to Frauwallner (Frauwallner, 1956), several of these missionaries were responsible for founding schools in various parts of India: Majjhantika was the father of the Kasmiri Sarvastivādins; Yonaka Dhammarakkhita may have been the founder of the Dharmaguptaka school; Mahādeva, sent to the Mahisa country may have been the founder of the Mahisasakas; and several teachers travelled to the Himalayas where they founded the Haimavata school, including a certain Kassapagotta, who may be connected with the Kasyapiyas. Relics of some of the Haimavata monks have been excavated at Vedisa in central India. The most famous of the missionaries, and the main focus of interest for these Theravada histories, is Mahinda, who travelled to Sri Lanka where he founded the school we now know as Theravada. The Mahāsanghika, for their part, remember things differently: they allege, in the Sāriputraparipriccha that there was an attempt to unduly expand the old Vinaya. The Mahasanghikas' own vinaya gives essentially the same account of the Second Council as the others, i.e. they were on the same side. An entirely different account of Mahāsanghika origins is found in the works of the Sarvāstivāda group of schools. Vasumitra tells of a dispute in Pātaliputra at the time of Ashoka over five heretical points: that an Arahant can have nocturnal emission; that he can have doubts; that he can be taught by another; that he can lack knowledge; and that the path can be aroused by crying "What suffering!". These same points are discussed and condemned in Moggaliputta Tissa's Kathavatthu, but there is no mention of this Council in Theravadin sources. The later Mahavibhasa develops this story into a lurid smear campaign against the Mahasanghika founder, who it identifies as "Mahadeva". This version of events emphasizes the purity of the Kasmiri Sarvastivadins, who are portrayed as descended from the arahants who fled persecution due to Mahadeva. By the time of the Fourth Buddhist councils, Buddhism had long since splintered into different schools. The Theravada had a Fourth Buddhist Council in the first century BCE in Tambapanni, i.e. Sri Lanka, at Aloka Lena now Alu Vihara during the time of King Vattagamani-Abaya. However it should be clarified that an anonymous local chieftain had given patronage and not the king, since he was a firm follower of the Abayagir school (a Mahayana Sect.). In fact one of the main reasons for the Council was the cruel policy the king held against the Mahavihara Priests who were Theravadians who were once attacked at the Mahavihara Premises killing many and driving away the others. The temple was destroyed and in its place a Mahayana Temple was built. The other main reasons for the Council were the unstable political situation within the country due to constant invasions which lead the king himself to flee several times and also severe famine. It is said to have been devoted to committing the entire Pali Canon to writing, which had previously been preserved by memory. No mention had been made as to who led this Council, for which the approximate cause would have been the deteriorating status of Buddhism then, and the collective effort by the priesthood to preserve the religion in its purest form therefore not needing a leader(only the fact that the Mahavihara priesthood i.e. Theravada school took part in this recital and compilation had been mentioned). 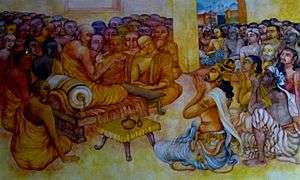 Another Fourth Buddhist Council was held in the Sarvastivada tradition, said to have been convened by the Kushan emperor Kanishka, in 78 AD at Jalandhar or in Kashmir. It is said that Kanishka gathered five hundred Bhikkhus in Kashmir, headed by Vasumitra, to systematize the Sarvastivadin Abhidharma texts, which were translated from earlier Prakrit vernacular languages (such as Gandhari in Kharosthi script) into the classical language of Sanskrit. It is said that during the council three hundred thousand verses and over nine million statements were compiled, a process which took twelve years to complete. Although the Sarvastivada are no longer extant as an independent school, its traditions were inherited by the Mahayana tradition. The late Professor Etienne Lamotte, an eminent Buddhologist, held that Kanishka's Council was fictitious. However, David Snellgrove, another eminent Buddhologist, considers the Theravada account of the Third Council and the Sarvastivada account of the Fourth Council "equally tendentious," illustrating the uncertain veracity of much of these histories. Another Buddhist Council, this time presided by Theravada monks took place in Mandalay, Burma, in 1871 in the reign of King Mindon. The chief objective of this meeting was to recite all the teachings of the Buddha and examine them in minute detail to see if any of them had been altered, distorted or dropped. It was presided over by three Elders, the Venerable Mahathera Jagarabhivamsa, the Venerable Narindabhidhaja, and the Venerable Mahathera Sumangalasami in the company of some two thousand four hundred monks (2,400). Their joint Dhamma recitation lasted for five months. It was also the work of this council to approve the entire Tripitaka inscribed for posterity on seven hundred and twenty-nine marble slabs in the Burmese script before its recitation. This monumental task was done by the monks and many skilled craftsmen who upon completion of each slab had them housed in beautiful miniature 'pitaka' pagodas on a special site in the grounds of King Mindon's Kuthodaw Pagoda at the foot of Mandalay Hill where it and the so-called 'largest book in the world', stands to this day. This Council is not generally recognized outside Burma. The Sixth Council was called at Kaba Aye in Yangon (formerly Rangoon) in 1954, 83 years after the fifth one was held in Mandalay. It was sponsored by the Burmese Government led by the then Prime Minister, the Honourable U Nu. He authorized the construction of the Maha Passana Guha, the "great cave", an artificial cave very much like India's Sattapanni Cave where the first Buddhist Council had been held. Upon its completion The Council met on 17 May 1954. As in the case of the preceding councils, its first objective was to affirm and preserve the genuine Dhamma and Vinaya. However it was unique insofar as the monks who took part in it came from eight countries. These two thousand five hundred learned Theravada monks came from Myanmar, Thailand, Cambodia, Laos, Vietnam, Sri Lanka, India, and Nepal. Germany can only be counted as the nationality of the only two western monks in attendance: Venerable Nyanatiloka Mahathera and Venerable Nyanaponika Thera. They both were invited from Sri Lanka. The late Venerable Mahasi Sayadaw was appointed the noble task of asking the required questions about the Dhamma of the Venerable Bhadanta Vicittasarabhivamsa who answered all of them learnedly and satisfactorily. By the time this council met all the participating countries had had the Pali Tripiṭaka rendered into their native scripts, with the exception of India. The traditional recitation of the Buddhist Scriptures took two years and the Tripiṭaka and its allied literature in all the scripts were painstakingly examined and their differences noted down and the necessary corrections made and all the versions were then collated. It was found that there was not much difference in the content of any of the texts. Finally, after the Council had officially approved them, all of the books of the Tipitaka and their commentaries were prepared for printing on modern presses and published in the Burmese script. This notable achievement was made possible through the dedicated efforts of the two thousand five hundred monks and numerous lay people. Their work came to an end on the evening of Vesak, 24 May 1956, exactly two and a half millennia after Buddha's Parinibbana, according to the traditional Theravada dating.